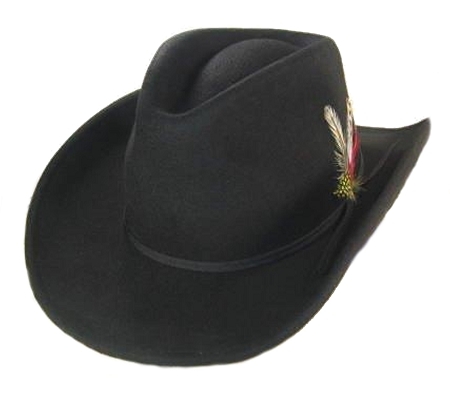 This gorgeous Black Felt Cowboy Hat is cat’s meow. The wide brim with a wire in it allows you to shape your hat to any style you like. The pinched front and feather in the band add the perfect dressy touch. High Quality hat and good fit. I wear this jay almost every day. In fact this it's my third copy. Actually big enough and dead hot. Excellent hat for the price. 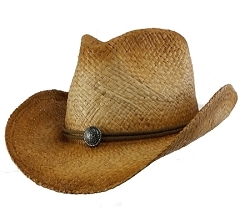 I've finally found a cowboy hat that fits. I'd really like to see others with a wider brim and some other colors. Great customer service. Great looking hat that I finally found one to fit my son. Fits beautifully, great quality, prompt delivery, packaged well. Son is delighted and so am I! Now I know where to shop for hats for my sons! Finally found a western hat that fits my big head. The hat itself is wonderful,good quality and stylish.